This case study will examine the conflict between Malagasy farmers and herders, who can be categorized as the peasant class, and the environmental activists and Malagasy government officials, who make up the elite class. These two groups have been involved in a conflict over the issue of landscape burning, or the practice of using fire as a tool to manage land resources. This conflict can be viewed as a political ecology issue, in that it carries both environmental and political implications. Deforestation, soil degradation, loss of bio-diversity, and desertification are all consequences of excessive landscape burning. These factors will all contribute to global climate change if left unchecked. Conflict in Madagascar between the ‘elites’ who seek to eliminate landscape burning as a method of resource management and those who rely on it as cheap and efficient tool is, and will continue to be, an issue of global importance. Madagascar, the world’s fourth largest island after Greenland, Borneo, and New Guinea, possesses an unparalleled level of bio-diversity due in part to its isolation. Its landscape has remained relatively well preserved, as major industrialization has not occurred on the island. However, Madagascar faces a different kind of threat to its virgin ecology. This threat comes not from industrialization but from the archaic practice of landscape burning as a method of resource management. Man has long used fire as a tool and its use has had important consequences on both human development and the environment. The threat to the environment that this form of resource management poses has placed two groups into conflict, the Malagasy government and the peasant population. On the one hand, the Malagasy government and environmental protectionists, through their “anti-fire received wisdom”, meaning the knowledge of ecological, claim that the use of this method will have severe environmental consequences for not only the island, but for the world.1 These consequences will be manifested in deforestation, soil-erosion, bio-diversity loss, and desertification. The concerns about global climate change compound the fears of the elite class and turn a seemingly local issue into a global one. 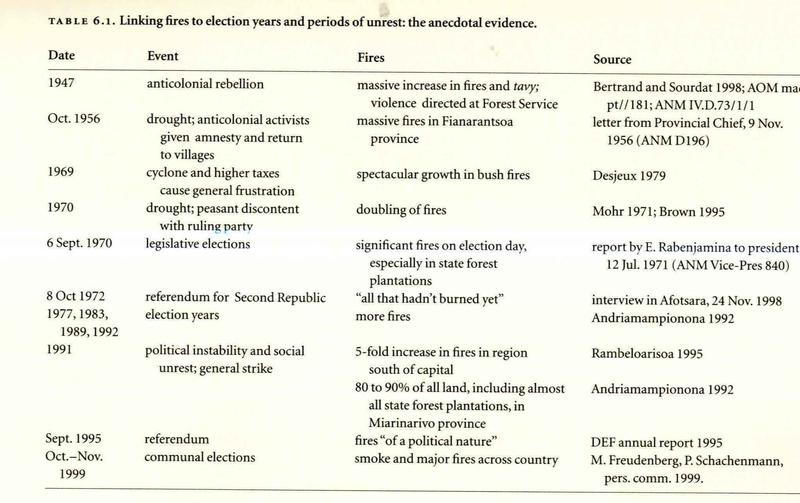 Historical highlights of the conflict include the first ban on pasture fires in 1896 under the French colonial authority, the emphasis placed on nature conservation and the fear of deforestation in the late 1920s, to the revolutionary period in the late 1960s, where limitations on fires were opened up. More recently, from the post-revolutionary period to today, the government has conducted education and propaganda campaigns in order to instill a sense of self-regulation on the use of fire in resource management. Additionally, in the late 1980s and early 1990s, international environmental organizations have entered into the conflict, pressuring the government to act against the local farmers and herders. These developments have made an impact on the sociopolitical situation, pitting 'elites' against 'peasants' and fed the fires of political unrest, manifesting most recently in the violent uprising after the contested 2002 election. PRIMARY: In colonial period, the French authorities (e.g. Les gendarmes depicted below). 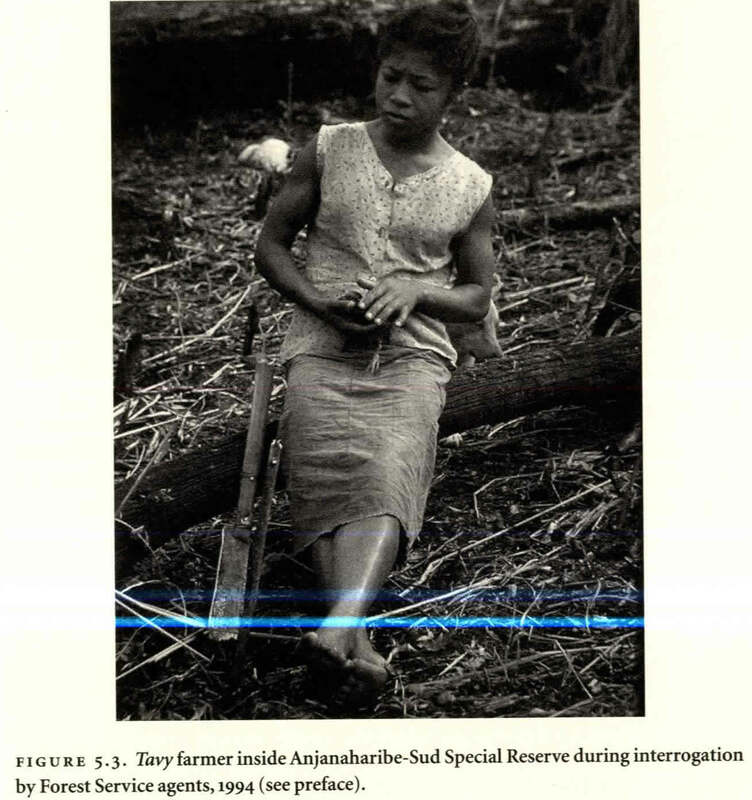 Post-colonial period, the Malagasy government, military, and environmental organizations. SECONDARY: Rural populations of farmers and herders. The landscape-burning conflict in Madagascar centers around the issue of natural resource use and protection, in this case, the forests. 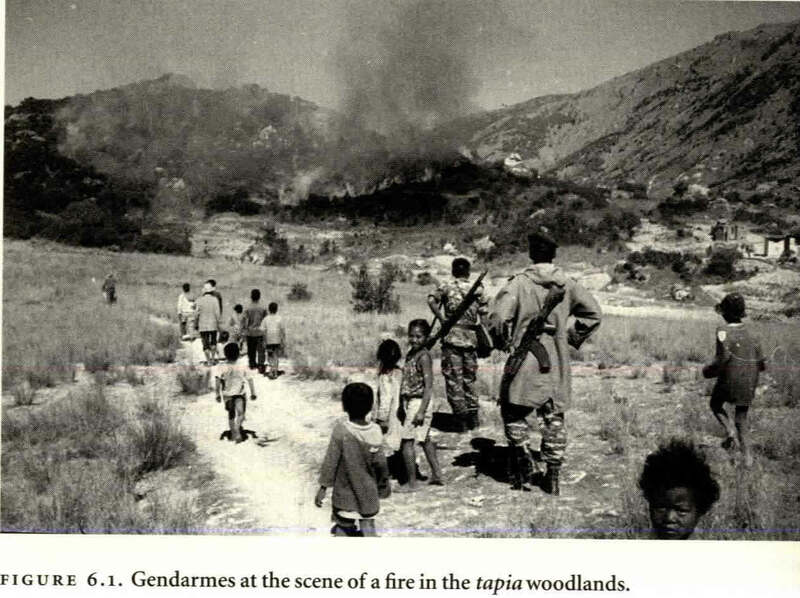 As Christian A. Kull puts it, “Madagascar is not just aflame; it has a fire problem, a century-long conflict over natural resource use and protection”.1 The dispute over land usage coincides with sociopolitical conflicts already existing in the country. It indirectly causes these conflicts to intensify and broadens the conflicts to include parties affected by the issue of landscape burning. Farmers use fire to clear land for crops. It is a cheap and effective tool for creating arable land and maintaining their livelihoods. On the other hand, conservationists, which includes government forces and international environmental organizations, wish to maintain Madagascar’s forests, as the fires lead to “a variety of ills, including deforestation, desertification, rangeland impoverishment, soil degradation, and accelerated erosion”.3 The conflict, therefore, arises between these two groups, with environmental concerns and livelihoods at stake. The conflict over forest resources can be described as internal, as it involves parties within the state and, due to Madagascar’s geographic isolation, does not involve other states. While the issue of landscape burning in Madagascar has not caused any direct casualties, it has been a factor in causing conflict and a tense sociopolitical environment. 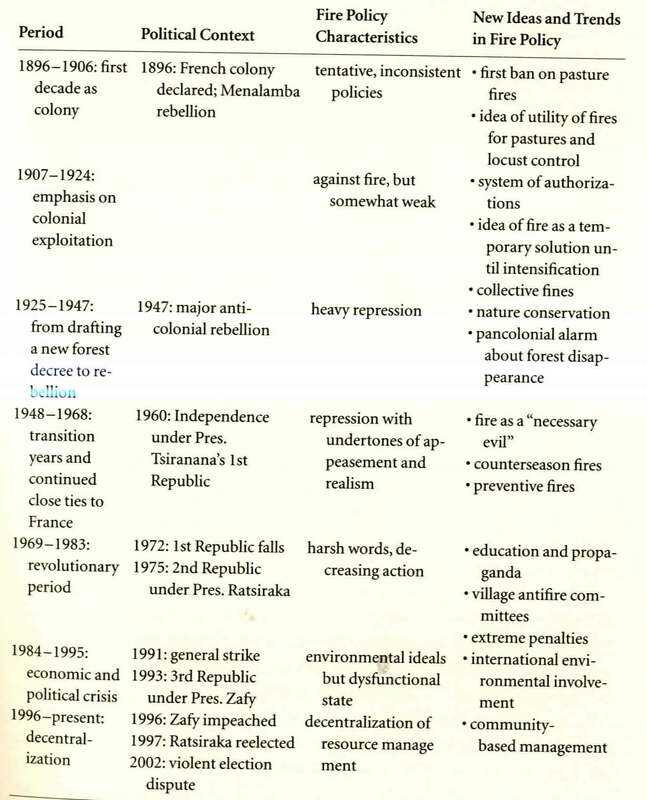 French policy on landscape burning during the colonial period, 1894-1960, was a factor leading to a large-scale revolt in 1946, resulting in 11,000 Malagasy casualties.4 In 1972, student protests in Antananarivo became violent, setting fire to government buildings in the capital. The protesters were motivated by economic stagnation and the weakness of the central government. The military opened fire on the protesters on May 13, 1972, killing 40 of them.5 More recently, the contest between Didier Ratsiraka and Marc Ravalomanana for the presidency in 2004 nearly led to the secession of half of the country. Ravalomanana comes from the largest ethnic group in Madagascar, the Merina, who tend to be the more industrialized and organized economic and political actors on the island. Ratsiraka belongs to the Betsimisaraka tribe, the second largest ethnic group, who are most numerous on the eastern coast and depend upon fishing and traditional farming techniques for their livelihoods.6 Some of these groups formed armed resistance groups, especially the tavy farmers who clashed with government forces. The situation in Madagascar over landscape burning possesses traits of an indirect conflict. Beginning in the 1930s, the government attempts to curtail the use of fire by the rural farmers and herders have been contentious and largely unsuccessful. However, the prolonged nature of this conflict exemplifies its indirect nature. The use of fire diminishes resources and has economic and environmental implications, leading to a decline in available resources to the Malagasy. Thus, fire itself is not the issue, but the consequences of its use and the costs and benefits to the respective groups involved. 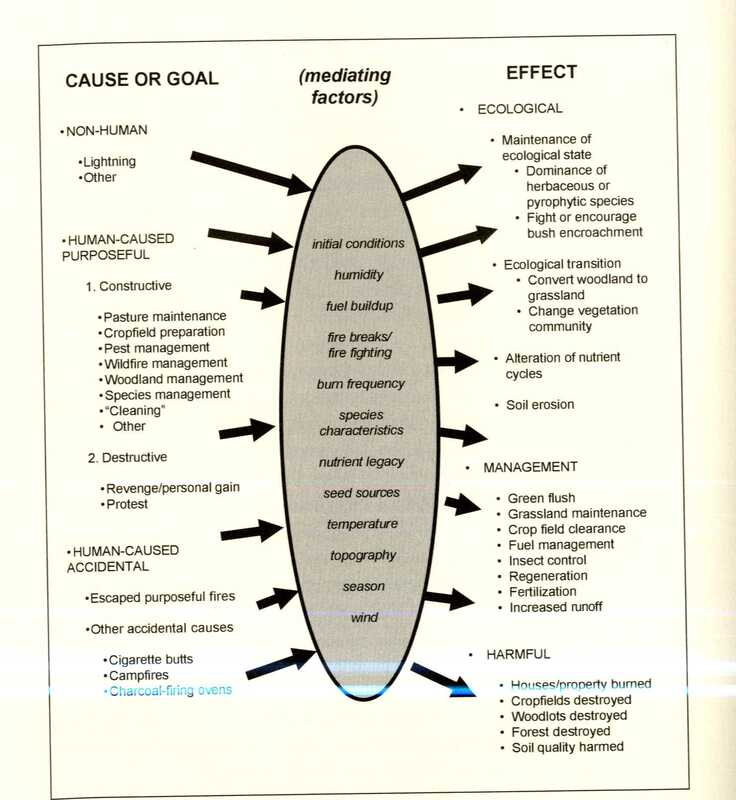 The following diagrams depict the flows of causes and effects in the landscape burning issue. The conflict over landscape burning in Madagascar exists between primarily sub-state actors. The government, who seeks to protect the natural resources and environment, sees landscape burning as a threat while the rural population has long used landscape burning as an effective resource management tool. Laws and restrictions placed upon the rural population regarding the use of fire have generated animosity between these groups. Some international environmental organizations have involved themselves in the conflict but their role is limited. The outcome of the dispute has not yet been determined. The historically rooted nature of the conflict has produced an environment where resolution cannot be achieved holistically. The rural farms depend upon fire and the government continues to see it as a threat. The success of one group effectively means the decline of the other. The zero-sum nature of the conflict guarantees that it will require compromise and partial resolution. 1 Kull, Christian. Isle of Fire: the Political Ecology of Landscape Burning in Madagascar. University of Chicago Press. 2004. 6 The World Factbook. Madagascar. 8 Kull, Christian. Observations on Repressive Environmental Policies and Landscape Burning Strategies in Madagascar. African Studies Quarterly. May, 2003. 9 Kull, Christian and Marcus, Richard R. Setting the Stage: The Politics of Madagascar’s Environmental Efforts. African Studies Quarterly. May, 2005. 10 Gran Denelle, Tucker, Compton, Steininger, Marc and Slayback, Dan. Measuring the State of the World’s Forests An Introduction to the Scientific Analysis of Forest Cover and Forest Loss. Environmental Defense Fund. January 17,2001.